It is amazing just how many people are injured each year due to negligence. Unfortunately, all too often the victim of negligence is a minor. And as a Boston child injury lawyer (and father of two young children), Attorney Christopher Earley understand the challenges faced by parents when their child has experienced personal injury. When our office represents a minor injured from an accident, it is the child’s parents that decide issues such as settlement, and other case-related issues. The reason is because the law considers the minor too young to make these types of decisions. In fact, it is the child’s parents that signs the paperwork that retains us because the law does not permit minors to enter into contracts. Getting Hit By A Car – Children getting hit by motor vehicles is sadly a common occurrence. These accidents frequently happen when the child is in a crosswalk. These accidents can also of course occur outside of a crosswalk. Regardless, these types of child accidents typically arise from inattention on the part of the car operator. They often can be caused when a child darts out unexpectedly into the street, leaving the driver of the car with little or no time to avoiding striking the child. In these instances, proving negligence against the driver can be very difficult, and sometimes impossible. 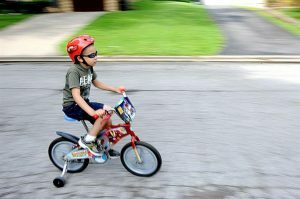 Bicycle Accidents – Children love to ride their bicycles. Unfortunately, drivers sometimes don’t pay proper attention and end up striking innocent children on bicycles. These accidents can cause very serious injuries. Like pedestrian accidents, bicycle accidents can also arise when a child darts out into the lane of travel of a car. Dog Bites – As mans best friend, dogs unfortunately bite children quite frequently. Dog bites can cause a child to be scarred, both physically and emotionally. It is common for the child to develop a fear of dogs that can endure well into adulthood. These accidents are sometimes unavoidable given the inherent unpredictability of dog behavior. In fact, children are the number 1 victim of dog bites. Daycare Center Injuries – We also represent children and their families for daycare center injuries. These accidents are quite common and are claims for negligence against the daycare facility that negligently caused injuries to a child. If your child has been injured you may be confused on where to turn. I invite you to call us today as we’d be happy to give you an honest assessment as to the rights your child has. We don’t get paid unless we win your child’s case.